Nisha from Local to Global Life Works made this short interview with the folks from New Frontier Family Farm during a visit with the L.A food lobby people (a local food coop/food buyers club). It’s really cool to see and hear the people that raise the things you eat. Please visit Nisha’s original post to see more pictures and get the full scoop on the visit to the farm. Thank you Nisha! For those out there who occasionally like to purchase food outside of the normal distribution networks (although why we don’t just blindly believe that FDA ‘oversight’ of un-inspected food processing factories keeps us safe is beyond me), there is bad news. Grist.org is reporting that “Raids are increasing on farms and private food-supply clubs“, and has some handy tips for anyone involved in such a project for protecting themselves and the project. Sad, but recommended reading. people often ask me “where do the veggies come from?” when i talk excitedly about the delivery of abundant, locally grown, organic, affordable produce that gets sorted in our lobby for distribution every sunday. i say “Jaime Farms, a local farm”, but can’t say much more. so i was happy to see that Jaime Farms’ co-owner Sotera Jaime, was featured in an LA Times article yesterday. it doesn’t describe the farm itself so much, but adds a human face and credibility that the farm does exist and it is local. if you want join the “food lobby” and partake in the volunteer-run sharing of healthy deliciousness, you can check out the food lobby website. The co-owner of Jaime Farms is up before dawn to help out at one of the farms’ 20 or so farmers market stands. But she still finds time each day to make a hearty hot lunch for family, friends and employees. Sotera Jaime and her trusty 10-quart stainless steel stockpot have seen a lot of mileage over the years. 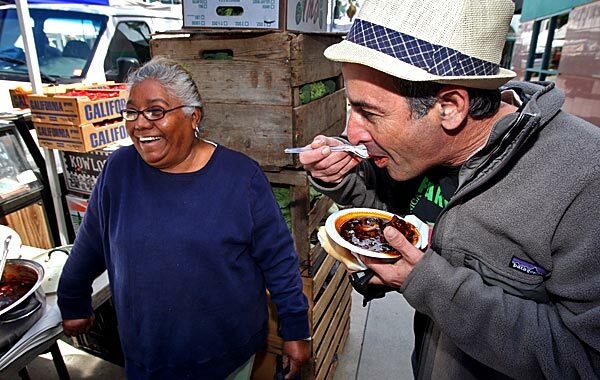 As the matriarch of one of Southern California’s most popular farmers market families, almost every day Jaime cooks up a hearty hot lunch for an ever-changing cast of a couple dozen extended family members, farmhands and part-time sales employees.